Nalboor News How Durable is Wood Look Plank Porcelain Tile? People love the look and warmth of wood, but they don’t always love the maintenance that comes with natural oak or cedar. A better option for busy households is wood look porcelain tiles. Available in a range of shades through Nalboor Tiles, a wholesale natural stone tile manufacturer, these options are highly durable, attractive, and the perfect choice for your next renovation project. It’s a universal truth that wood and water really don’t mix. While sealed wood floors can handle the occasional spill and a certain amount of moisture, they won’t survive in areas that are chronically wet. This means that wood floors have historically been avoided in bathrooms, kitchens, and basements. However, the wood look porcelain tiles make it easy to put the look you love in high-moisture areas. Install these tiles in the bathroom, the works areas in your kitchen, down in the basement, and even on the lanai. You won’t have to worry about seams swelling from water damage or floors buckling from too much moisture. One of the downfalls of wood floors is that they can be damaged by claw marks. While this isn’t too much of a concern with small canines, it can become a serious issue with larger breeds. There are steps you can take to keep your wood floors safe from your pet’s nails, but you won’t have to worry about damage when you make the switch to Vancouver Maroon Wood Look plank porcelain. This product will maintain its shape even against most high heels, animals, and shoe treads. People who love wood will agree that it doesn’t always wear well in high-traffic zones like entries. The finish can wear unevenly and leave the floors looking worn and damage. However, porcelain tiles will maintain their beautiful color and style even if they see regular foot traffic. Use them in the foyer, by the patio door, and in your utility room. They’ll always look great, and you’ll love how they warm up any space visually. While you can plan on having to refinish wood floors at some point, you can trust that your porcelain tiles will last for ages. 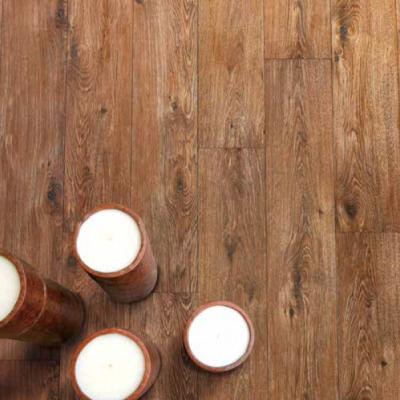 Environmental factors can damage natural wood, but they won’t alter your porcelain. Direct sunlight is known for lightening the stained finish on oak floors, but Calgary Crema Wood look plank tiles will hold their beautiful gold hue indefinitely. Regular foot traffic can wear the finish right in the middle, but your porcelain tiles will have a consistent look from one wall to the next. If you’re worried about the finish on wood slowly vanishing, then you’re sure to be pleased with the porcelain alternative. Wood planks are designed by nature, and that includes some flaws. Many homeowners don’t mind the look of knots, but the problem with knots is that they can gradually dry out and shrink. What’s left behind is an unsightly hole that can mar your beautiful floor. When installing wood floors, you need to carefully inspect each and every plank to be sure that there are no knots on the surface or below. If you make the switch to porcelain, then you won’t have to worry about how knots and other imperfections can change over the years. The tile will maintain its smooth surface even if you have higher humidity levels or very dry air in the home. It should be noted that tile is not completely immune to damage. A falling object can crack the tile and leave an unsightly mark on your floor. However, tiles are easier to replace than tongue and groove wood flooring. Wood floor repairs are extremely costly because it takes a skilled craftsman to cut out the damaged areas and secure the new patch without leaving any nails exposed. However, Nalboor Tiles are easily replaced if they should be broken. In fact, the process is so easy that most homeowners can do it themselves. Simply use a hammer to break the tile further and remove the pieces. Clean out the grout, scrape away the mortar, and nestle a new tile into position. After replacing the surrounding grout, your floor will look like new! The terms porcelain and ceramic are used interchangeably, but they’re actually made with very different processes. Porcelain is denser and has a less porous nature than ceramic. This makes it more resistant to stains, cracking, and other types of damage. Those same features also make it more durable than any type of wood flooring. Made from very fine, dense clay, it’s fired at higher temperatures than ceramic. This also makes it more resistant to scratching and surface damage. Porcelain is also less likely to crack if something heavy falls on it, and that can be a great selling point for active families. Whether you’re renovating your own home or putting together a design plan for a client, look beyond traditional wood floors to a more durable product. In addition to being ideally suited to damp areas and high-traffic zones, the porcelain wood look tiles will also be easier to maintain and clean than wood. They don’t have to be polished, and you’ll never have to worry about refinishing them. Nalboor Tiles has several different colors in stock, so call us today at 305-501-4548 for more information on this impressive product. You can also contact us online to review all of the options and see which tile is right for your building project.